Support CCLAS with a tee! 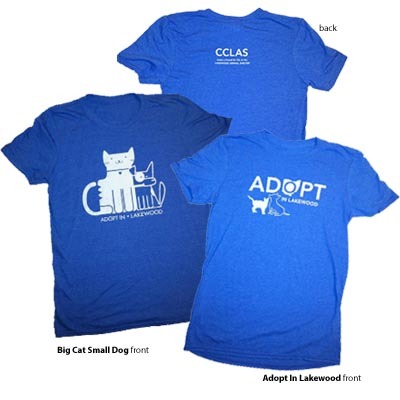 new CCLAS "Adopt in Lakewood" tee. FREE SHIPPING! For international orders, please contact us by email for the approriate shipping fee. CCLAS is a small, volunteer organization that works alongside the Lakewood Animal Shelter, in an effort to improve and protect the lives of Lakewood’s pet companion population. By providing financial and volunteer resources, we aid in the adoption of abandoned animals and in their well-being during their stay at the shelter.